President Trump's supporters in the media came out in full force this weekend, supporting the President after he called for the firing of NFL players who have chosen to raise awareness of racial injustice by kneeling during the national anthem. "Don't give me this crap that you want to support reform and stand up against social injustice," snarled Judge Jeanine Pirro on her Fox News show Saturday evening. "Shame on you. Shame on all of you. And shame on you too, Roger Goodell, for not showing you love this country as much as the president does." That sentiment was shared widely in the pro-Trump media universe, where Trump was portrayed as a patriot taking the battle to wealthy athletes who were characterized as behaving in an un-American manner by refusing to stand for the "Star Spangled Banner." "What is it about the modern day @TheDemocrats party where they kneel during anthem, torch US flags and cheer cop killers?" asked Jim Hoft, the publisher of the far-right Gateway Pundit, a blog trafficked by millions of people each month. What is it about the modern day @TheDemocrats party where they kneel during anthem, torch US flags and cheer cop killers? Pro-Trump media personalities also sought to suggest the decreased ratings for NFL games were tied to protests on the field. Ratings for NFL games are down, but not to the extent suggested by Trump and his allies. Sean Hannity, perhaps Trump's most loyal supporter on cable news, did not call for a boycott, but tweeted on Saturday that NFL Commissioner Roger Goodell appeared to be lecturing Trump and his fans, warning, "If @NFL and players choose to continue to make political statements (their right) I predict fans who disagree will flee (their right also)." A column by Daniel Flynn published on the far-right website Breitbart echoed that point. "If you want to see 'divisive' and a 'lack of respect,' turn on an NFL game and watch men making millions refuse to stand up for two minutes during the 'Star Spangled Banner.' Or, maybe, you opt not to do this," the Breitbart column said. "Increasingly, that ranks as the popular choice." In other corners of the web, Trump's supporters seemed to contend it was hypocritical for the NFL to allow players to express themselves on the field for one cause, but not another. On "The Donald" subreddit, a forum where die-hard Trump supporters gather and from which narratives in the pro-Trump media universe are often birthed, a top post noted that the NFL did not permit the Dallas Cowboys to wear decals on their helmets supporting the Dallas police. The decals had aimed to pay tribute to the officers who lost their lives after a 2016 downtown shooting. Trump's supporters in media also got creative when trying to discredit the President's critics. In a bizarre "Fox & Friends Weekend" segment, host Pete Hegseth read the statement from the Golden State Warriors announcing the team would not be accepting the customary invite to the White House for winning the NBA championship and said, "I mean, equality, diversity, and inclusion. It reads like a left-wing rap sheet." Newt Gingrich, who was being interviewed for the Fox News segment, added, "First of all, didn't they just win a championship? What is equal about winning a championship?" Hegseth then asked, "Are there women in the NBA? What about the WNBA? That's not equal." Trump and his allies are perhaps willing to engage in the debate over NFL protests because the position they have taken is popular with the base. A Quinnipiac University poll conducted in 2016 found that White Americans, who make up a large part of Trump's base, largely disapprove of national anthem protests. On Sunday, in response to the President's inflammatory remarks, the protests on the field amplified. 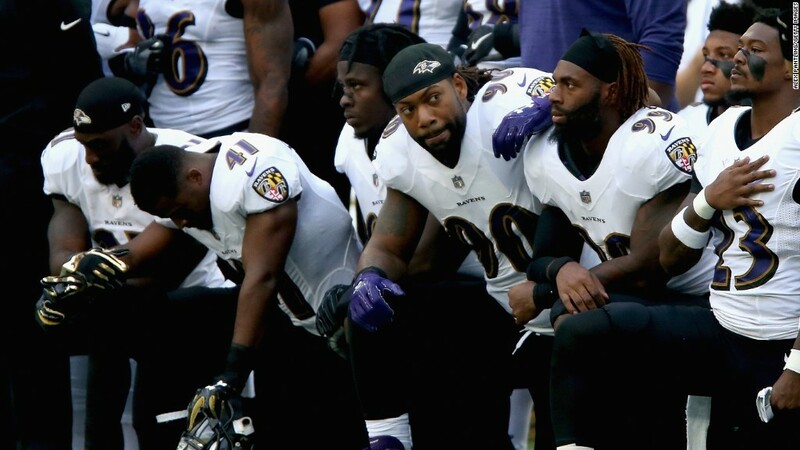 Many players took a knee ahead of the game between the Baltimore Ravens and Jacksonville Jaguars. The Pittsburgh Steelers were also remained in their locker room during the national anthem.